D & P Fencing Contractors plant and equipment is RMS G22 compliant, fitted with fire extinguishers, rotating and flashing amber beacons and reversing alarms. Our vehicles are serviced regularly and undergo a daily pre-start maintenance check to ensure that any problems are dealt with swiftly. All vehicles are comprehensively insured, certificates of currency can be provided upon request. Our Iveco truck has a Gross Vehicle Mass of 24 tonne and is used predominantly for carrying guardrail and wire rope materials and floating other plant and equipment to site.This vehicle is fitted with a Type A First Aid Kit that is attended regularly by one of our First Aid Officers. Drivers of this vehicle all hold current Heavy Rigid Licenses and Certificates of Competency for operation of the Hiab. 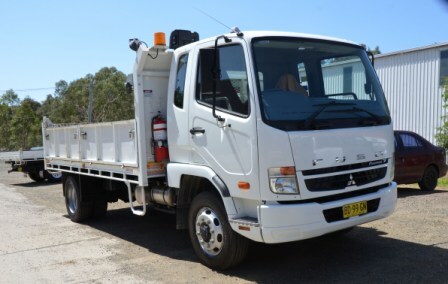 Our Isuzu truck has a Gross Vehicle Mass of 4.49 tonne and is used for carrying workers to and from sites and all work tools required for the installation of guardrail and wire rope fencing. This vehicle is also fitted with a Type A First Aid Kit that is attended regularly by one of our First Aid Officers. Drivers with a regular Class C license can operate this vehicle. 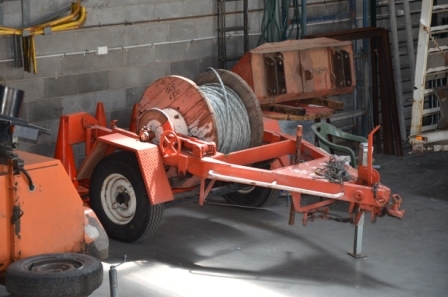 This trailer is used for carrying the wire rope whilst installers run the cable prior to tensioning it. The trailer is usually attached to the Isuzu Table Top truck for this activity. The tipper truck has a Gross Vehicle Mass of 12 tonne and is used to carry materials to and from sites and recycling or waste disposal depots, where removal of damaged fencing is required. The trailer floats other plant, such as the tractor, to and from sites. It has a GVM of 9 tonne. Drivers of this equipment must have a medium rigid license. 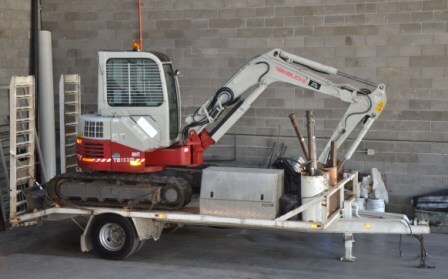 Our 5 1/2 tonne rubber tracked excavator comes with buckets, auger and rock pick attachments and is used mainly for boring holes for posts, excavating sites for end anchor terminals, and removing damaged fences. All our excavator operators have either previously held National Certificates of Competency for an excavator (LE class) or are being trained by other competent operators and are logging hours for this skill, as deemed appropriate by the new WorkCover laws governing load shifting machines, which came into effect on 30th Septemeber, 2011. Our tractor is fitted with a hydraulic post driver, front end loader and Roll Over Protection System (ROPS) canopy. The post-driver has top and bottom clamps to hold the post vertically when ramming posts and legs that are adjustable to allow for ramming over the top of kerb. 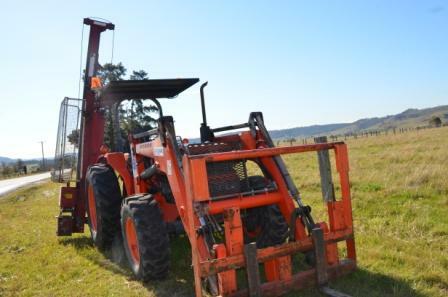 The post-driver features a protective metal mesh cage and a safety system, that will disable the post-driver when the cage is opened, it also has a secondary safety feature that requires the operator to hold a lever back to allow hydraulics to be enabled at the rear of the tractor. 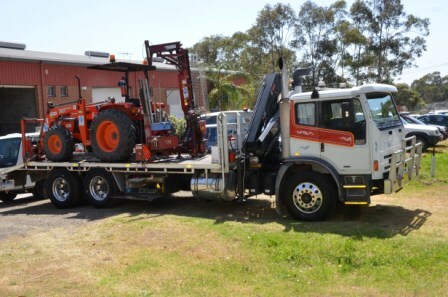 Only operators deemed competent by D&P Fencing Contractors Management use this vehicle. 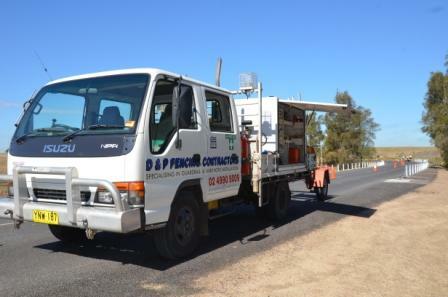 D & P Fencing Contractors are also able to provide traffic control on non-RMS roads using our two portable traffic lights. 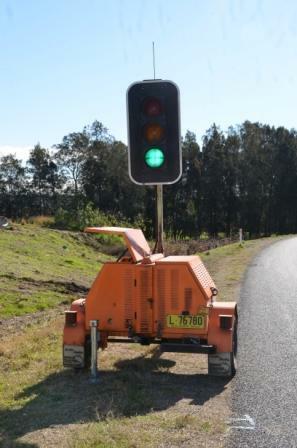 The use of these traffic lights is most suited to roads where the traffic volume is deemed to be low by a controller holding the minimum qualification of Select/Modify Traffic Control (Red Card). We possess all manner of RMS compliant traffic signs that can be used in conjunction with this plant. 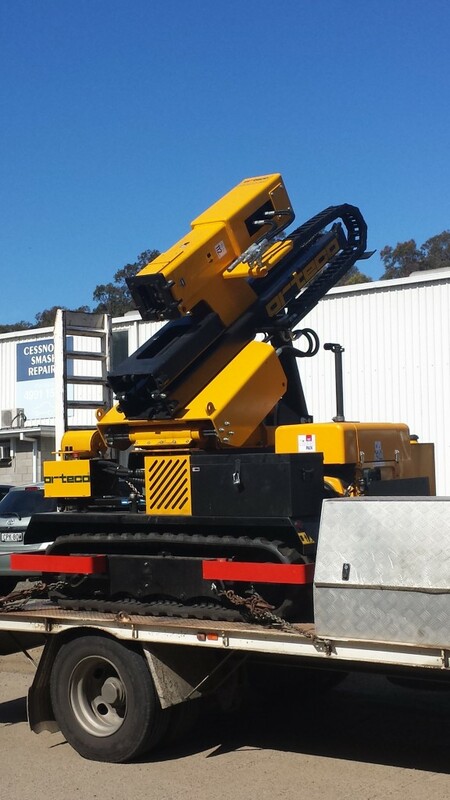 The Orteco was recently purchased in 2014 to help streamline our fencing operations. The Orteco can be used to both drive and extract posts on all manner of safety barrier fencing except wire rope. The Orteco features a unique percussion driving system, where the post is driven down with a vibrating plate as opposed to being thumped into position, which is much safer. We transport the Orteco on our tipper truck.